Born February 14, 1882 in Philadelphia, PA. His father's real name was Maurice Blyth (or Blythe) who had the stage name of Maurice Barrymore. His mother was Georgie Drew, the daughter of actor John Drew. He attended King's College, Wimbledon, and New York's Art Student League for a short time and pursued an art career briefly, but, coming from a stage family, it was natural that John and his older siblings, Lionel and Ethel, would be drawn to the stage where they all experienced success. He was eventually drawn to the movies, and his first confirmed appearance is in the 1914 Famous Players production "An American Citizen." It is possible he was acting in films as early as 1912, though. Barrymore made approximately 13 features from 1914-1919 that ranged from light comedy to drama such as "The Incorrigible Dukane" (1915) and "Raffles, The Amateur Cracksman" (1917). However, it was his portrayal in "Dr. Jekyll and Mr. Hyde" (1920) that brought him the motion picture fame he deserved with an uncanny metamorphosis from the kindly Dr. Jekyll to the evil Mr. Hyde that used little make-up. 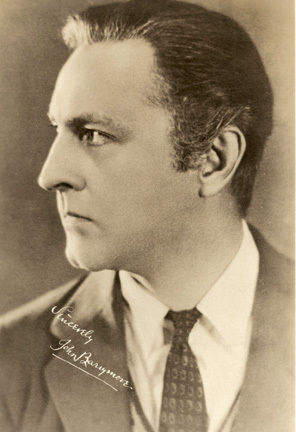 Barrymore did not make a lot of movies during the 1920's (approximately 13 from 1920-1929), he did film some "great" stories such as "Sherlock Holmes" (1922), "The Sea Beast" (1926), "Don Juan" (1926), "The Beloved Rogue" (1927) and "Tempest" (1928). At least two of these, "Don Juan" and "The Beloved Rogue" are excellent costume light-dramas that rival some of Doug Fairbanks' best. Of course, with a trained stage voice, Barrymore had no problem with the transition to the sound era and, working for MGM, he took part in some of the truly great films of the 1930's such as "Grand Hotel" (1932), "A Bill of Divorcement" (1932), "Rasputin and the Empress" (1932), "Dinner at Eight" (1933), and "Romeo and Juliet" (1936). Barrymore's extravagant living and alcoholism caught up with him, however, and he was reduced to lesser quality films in his last years such as "Hold that Coed" (1938) and a sad ending to a distinguished career in the awful "Playmates" (1941). In the late twenties, Barrymore married actress Dolores Costello who is Drew Barrymore's grandmother. Barrymore died May 29, 1942.